The D110Lite is an affordable clock and time distribution device to distribute externally fed 1PPS and reference (REF, i.e. 10MHz) inputs. For each input signal, there are eight BNC outputs (16 in total). Optionally the device can be equipped with an internal GPS receiver module that will source the 1PPS and a 10MHz REF signal internally. 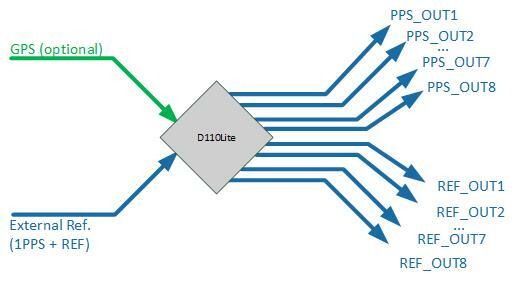 Distribute timing information for devices and network components. Synchronize devices for Single Frequency Network (SFN) operation. No need for external GPS receiver, ideal for sites that haven’t been upgraded with GPS timing receivers yet. Automatic fallback to external reference inputs in case of GPS signal loss.